Image caption Louis Makepeace said the college's actions left him "appalled"
Ramsay blasted the college for a "disgusting attitude" and said he would "offer him an apprenticeship any day". A spokesperson for Ramsay confirmed the tweet by him was a formal offer of work. "Gordon's tweet was a genuine offer of help for Louis Makepeace, should he wish to pursue his cooking career within the Gordon Ramsay Restaurants chef apprentice programme," the spokesperson said. She said the star of the Kitchen Nightmares and F Word TV shows had "supported and mentored hundreds of young chefs throughout his career, and strongly believes no one should be discriminated against in the workplace due to a disability." 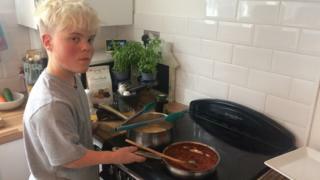 Louis, from Worcester, said he was initially offered a conditional place for the hospitality and catering course earlier this month, but claims the college backtracked because he was deemed too small for the kitchen. His mother Pauline, 56, claimed the course leader told her Louis should not do the course as he would not be allowed to work in a restaurant kitchen. Louis said: "I wanted to learn the skill, but I'm appalled by the way this has been handled by the college. "I'm not sure I would want to study at the college now, as they've messed me about and dragged it out for too long. "I still want to cook and one day open my own cafe or restaurant." He added: "I'm excited by Gordon Ramsey's offer on Twitter. Let's see what happens." The Heart of Worcestershire College said in a statement: "The college has undertaken a review process to ensure all the appropriate adjustments to the kitchens that Louis needs to allow him to safely and successfully commence his course, and to ensure his needs are met throughout his time at college are in place. "Due to the timing of Louis' application, this process is still ongoing and after further discussions, we hope to have a final outcome by the end of this week. "We would like to state that at no point has Louis been told he could not attend his course but both Louis and Mrs Makepeace have been informed that the adjustments Louis requires will need to be agreed before an unconditional offer can be given."